Microplush Mattress Pad Just $33.99! Down From $80! PLUS FREE Shipping! You are here: Home / Great Deals / Amazon Deals / Microplush Mattress Pad Just $33.99! Down From $80! PLUS FREE Shipping! Score this beautiful Microplush Mattress Pad at Amazon for just $33.99 down from $79.99 PLUS FREE shipping! The Beckham Luxury Microplush Mattress Pad provides and ultra-soft barrier between you and your mattress for the perfect night’s sleep. Our durable and long lasting design will keep your mattress pristine for years to come. Relaxation is a given with the additional loft providing an extra cozy layer to your mattress. When you are ready to clean just throw it in the washing machine and tumble dry, easy as that! The Beckham Luxury Microplush Mattress Pad is the perfect choice to protect your mattress and ensure the perfect sleep experience every time. For limited time only so hurry and get one now! MAXIMUM COMFORT: Our Microplush Mattress Pad – Queen (60″ by 80″ by 17″) – is filled to maximum capacity to provide an ultra-soft barrier between you and your mattress. The box stitching pattern is designed to ensure that you stay comfortable while shifting during the night. Everything about this product was designed to provide our customers with the perfect sleeping experience. 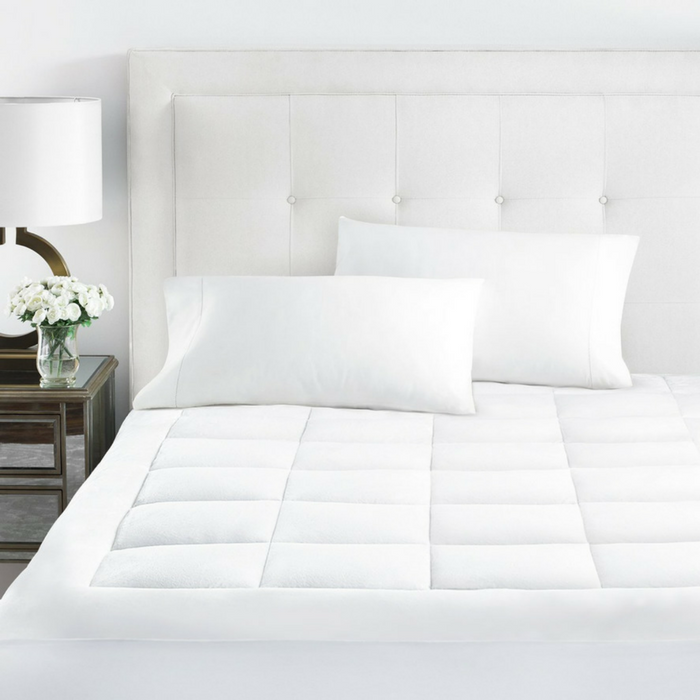 PROTECT YOUR MATTRESS: Safeguards against stains while preventing exposure to dust mites and other potential allergens to keep your mattress like new! Even a small stain can void a mattress’ warranty. Our mattress pad provides superior comfort and protection. PREMIUM QUALITY: Our products are made with the highest quality fabrics by master craftsmen, the long lasting design will keep your mattress pristine for years to come! EASY TO CLEAN: No expensive cleaning required. Simply machine wash and tumble dry!